Bob is the Configuration Manager administrator at ACME Jets contact center. He wants to create an online chat channel to support website visitors. He anticipates the website traffic to be heavy during peak hours, therefore, the agents should be able to handle multiple chats to meet the demand. He plans to collect some identity information such as customer’s name and account number to identify existing customers so that agents can process interactions efficiently. This information can be collected from the customers even before they are connected to the agents allowing agents to serve them faster and better. Enable ACME Jet agents to process multiple chats with customers and other agents on the same tenant. He knows by default the agents can handle only one chat at a time. Train his agents how to use the Multi-Chat. To create an online chat button to use during the business operational hours. To create an offline chat button to direct visitors during offline hours. To create a chat invitation to proactively invite website visitors to a chat. 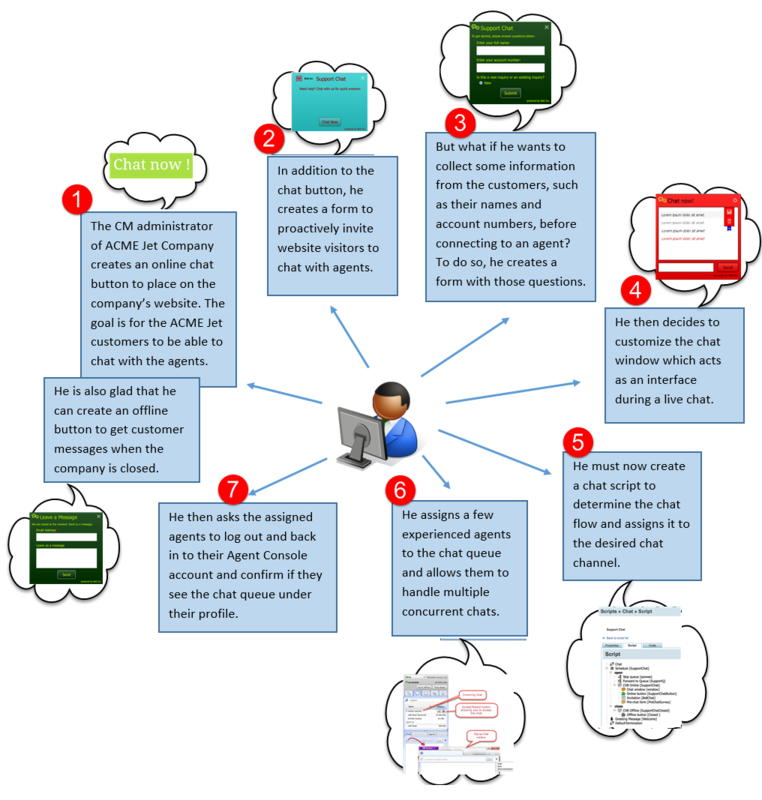 To create a chat form to gather information from a customer before initiating a chat. An Offline form to send an email message during chat offline hours. A chat window to serve as the interface between the Chatee and the agent during the chat. To design the chat flow. To enable to agents to have more than one chats. To train his agents how to use Multi-Chat.